Are you ready to give your home a fresh new look with some clever DIY Decorative Home Accessories? Check out our handmade Home Decor Collection and let it inspire you. Let’s check out some fun nautical decorative home accessories. These DIY Projects are easy and look amazing. Mirrors like the one below cost a pretty penny when you shop in home accent stores. Unique home decor accessories don’t need to be expensive? A Rope Mirror is a unique home accent piece you can easily make yourself. You could easily spend $ 50 or more in stores, but only a few bucks when you make it yourself. Imagine this one in your entry room, bathroom or hallway. Cut out cardboard to size of mirror and glue mirror onto cardboard circle. Cut four or more pieces of rope long enough to enclose mirror. Each piece will be a little different in length. Glue pieces onto mirror but leave open ends unglued for now. Tie your string several around end pieces and glue them to the mirror. You are ready to hang your masterpiece. The tied rope rug takes a little more work than it’s glued counterpart but is not as difficult as it may seem. Follow the pattern in the pic, it’s not complicated once you figure out the pattern by looking at the first picture. Stringing the Rope 2 or 3 times in the same pattern will create a nice dense and lasting rug. A rope bowl is super easy and quick to create. The thicker the rope the quicker the bowl is finished. Simply start by gluing the rope in a circle and expand the diameter as you create the rows. Make it as big and wide as your wish. Rope bowls make for amazing accent pieces for shelves, or if you don’t know what to put on the coffee table, fill this bowl with whatever you like and place as centerpiece. This one is so simple you’ll wonder why you never thought of it. All you need is a nice size tree stump. Cut into different lengths and drill or carve a hole in the middle. Arrange them and place candles (I like flameless for safety) and enjoy the ambiance. Want to be able to tell time all the time when home? I do have some wood slices in the garage and this is the perfect project. Similar clocks cost a fortune in Stores, but are very inexpensive to create yourself. All you need is a wood slice, clock mechanism (approx. $ 5-15 depending on size) and numbers decals or wood burner. I love the idea of burning the numbers directly into the wood. The most unique home decor ideas are often made of wood. Readily available, often right in your backyard, wood is versatile. Decorative home accessories bring a little nature back into the home. The pieces below are among some of the most unique accessories not found in home accessories stores. However, they can be replicated fairly easily as you will see. I fell in love with this coffee table the second I saw it. However, the price tag of this nouveau-rustic furniture piece is hefty. This is a perfect weekend project and a unique home accent pieces that can be customized to size. A little different but same concept, except this is from a tree stump. Easier and faster if you can find one that big. The tree stump needs to be completely dry. Tilt it of the floor and let it dry out for a couple of months (yeah I know, takes a long time depending on size). Strip the stump of it’s bark and sand it down. Use wood stain to protect your diy home decor and ad wheel casts. That’s it. Spend your next weekend making your own decorative home accessories like this table. You may already have some of the supplies needed for this diy home decor item. Another gem among simple yet gorgeous decorative home accessories. Ever wonder what you could do with old cabin doors. Well, here it is. 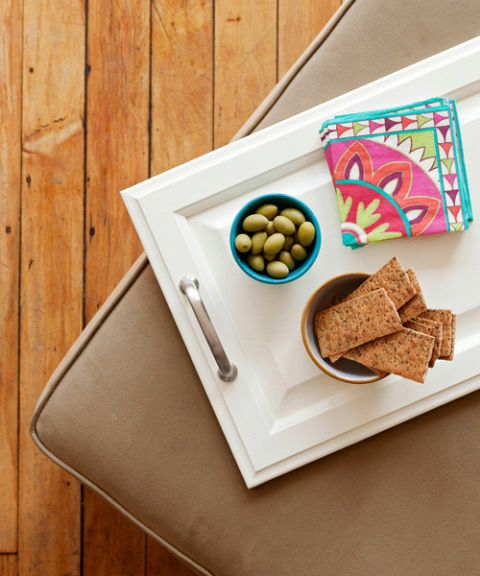 A Cabin Door Tray will certainly be the most practical and a favorite among your diy home accessories. Old cabinet doors can often be found for cheap at local trade days or thrift stores. Sand, paint and attach hardware. Takes next to nothing on time if you don’t count drying the paint. Who doesn’t need a tray here and there. And if you don’t serve stuff, use it to display stuff 🙂 This makes for a perfect coffee table decor tray. This is genius. A simple wooden stick turned into a functional piece of decorative home accessories. Would this look great on the wall of your staircase? But wait. I couldn’t resist to feature this one too. If you have as many trees around you as I do you understand my excitement about these decorative home accessories made from wood. Decorative home accessories don’t have to come with a steep price tag. The most amazing accessories are diy home decor with items that repurposed or recycled. Home Decor takes on a different meaning when it’s handmade. Diy Home Decor is cherished and as such a wonderful Gift Idea.